We’ve just got to dinner time on our second day in London and my legs are feeling pretty tired, and we are just off out again to see Mamma Mia. Today has been pretty full, first up was a trip to the Tate Britain, mostly we went to see the Turner collection and some Constable paintings but there were some pretty impressive modern works. I think that Francis Bacon must have seen the world from a completely different perspective from mine but I liked the couple of Hockney’s I saw. 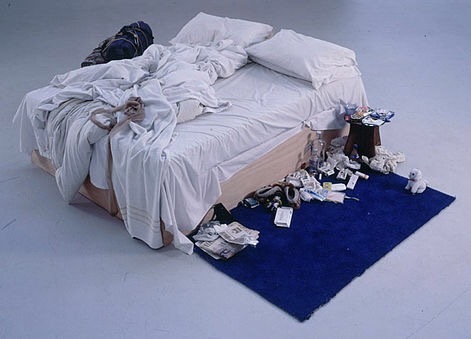 The notorious Tracey Emin’s “My Bed” (below) which was sold for 2.5 million pounds was good for a chuckle about the vagaries of the art world. Paulette got a bit close to the bed and caused the alarm to sound, but the attendants, fortunately, thought it was a great joke. We thought a trip to Harrods might be good for a laugh and getting lost amongst the designer fashions left us wondering how anyone could need or want to spend so much money on clothes. I found a modified iPhone for fifty thousand pounds, mind it did have a solid gold, diamond and ruby encrusted case but it did leave me wondering what the purchaser would do in a year or so when a new model made the phone obsolete. A wander down Brompton Road took us to the Victoria and Albert Museum where we had a fairly casual look at early, mostly religious, works from Europe which were obviously so precious that I am sure that the people from the countries where they came from would love to have them back and may feel that they had been looted. The British works were brilliant and warranted more time than we could give them. We are just back at our hotel in Paddington after seeing Mamma Mia. The cast put so much effort into the performance and the Abba songs were great so we came away having really enjoyed it. I think it was probably more fun than any other show I’ve seen. Tomorrow we are in London until the evening when we fly to the Isle of Man. Enjoying catching up with your “posts”.Great that you caught up with Amy, who would love seeing you, and you her. Mamma Mia would be amazing to see with a very professional cast. Lucky you! Best wishes for your time in the Isle of Man.